The new Blackwire 3200 series is both cost effective, and technically efficient. See below for a list of features. The Blackwire 5200 Series fits your busy workday. Easy to use, USB/ USB-C and 3.5 mm connectivity options let you work on a variety of devices. And it's so comfortable, you'll be able to wear it all day. 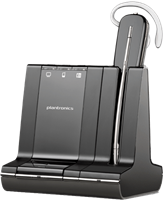 Use your Plantronics USB headset seamlessly between softphone and desk phone. Please see a list of compatible headsets below. Keep the focus on your conversation, not background noise, with the sophisticated noise canceling and immersive stereo sound of the Plantronics Voyager Focus UC Stereo Bluetooth headset. This headset only works with mobile and computer systems it will not work on a desk phone. The highest level of wearing style choice and best-in-class PC audio in a convenient, portable package. Convertibe, multiple wearing styles. The highest level of wearing style choice and best-in-class PC audio in a convenient, portable package. Convertible, multiple wearing styles with a hot swappable battery for unlimited talk time, extra battery and cradle sold separately. 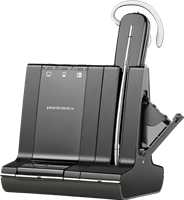 Enjoy wireless freedom while seamlessly managing PC, mobile and desk phone calls with a single intelligent headset system. Convertible, multiple wearing styles. Enjoy simply better conversations with the Savi 8200 Series. Effortlessly manage PC, mobile and desk phone calls, with enterprise-grade DECT audio. This unit replaces the Savi W710, which effective March 29th 2019 will be discontinued. Enjoy simply better conversations with the Savi 8200 Series. Effortlessly manage PC, mobile and desk phone calls, with enterprise-grade DECT audio. This unit replaces the Savi W720, which effective March 29th 2019 will be discontinued. Enjoy wireless freedom while seamlessly managing PC, mobile and desk phone calls with a single intelligent headset system. Convertible, multiple wearing styles with hot swappable battery for unlimited talk time, second battery/cradle sold separately.